How to publish flipbook on Dropbox? I publish the flipbook for personal use and I don't own a website. I know I can upload the flipbook online by using your paid Online Service, but except that, can I publish the flipbook on Dropbox? If you don't have a website and you don't want to pay for the Online Service, you can publish the flipbook on Dropbox for free. And after you upload the flipbook onto Dropbox, others can read it online via Internet. 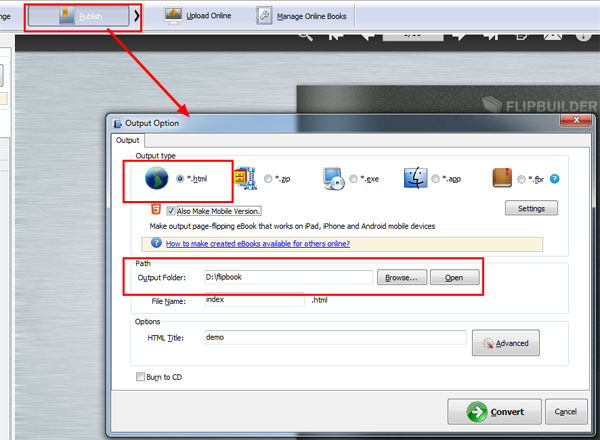 Download and install A-PDF Flip Book Maker, then start it, create a new project and import your PDF file. In the next screen, customize the book based on template. And then click "Publish" to output the flipbook in HTML format. Open your Dropbox and log in. After you log in your Dropbox, copy the output flipbook folder (with all the output files in it) and paste to the Public folder of your Dropbox. And you can right click to get the flipbook URL and open it in your browser for online reading.